Pascale Heuberger , interior designer and owner of Rougemont Interiors, has her roots in Zurich and Gstaad. She studied interior design in New York and went on to work for the renowned Brunschwig & Fils company. For 10 years she followed the design trends and fashions of the USA and, in 2006, established her own business, Rougemont Interiors. Since 2009 Rougemont Interiors now boasts an office in Zurich and, since December 2011, a magnificent store in the world known resort of Gstaad where Pascale’s impeccable taste is on display for all to enjoy and be inspired by. Pascale admits she is a perfectionist when it comes to finding “the most beautiful, luxurious things “to bring her trademark ” Cosy Modern” style to life. 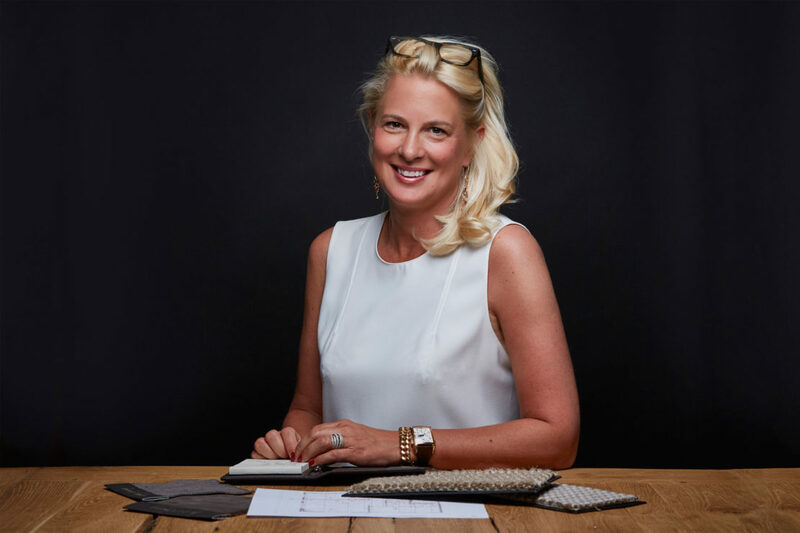 She has spent years developing a high standard network of elected manufacturers and craftsmen, which includes exclusive American, Belgian and Italian designers. At Rougemont Interiors, Pascale combines pure lines and modern design with rustic chic to create warm, comfortable spaces. With her distinctive soft, neutral colours and accesories, special items such as embroidered aqua pillowcases and zebra skin cubes make their input. Fabulous cashmeres and amazing leathers can be browsed by customers together with specially selected hand-made accesories. Rougemont Interiors offers private and business services throughout Switzerland. Pascale´s delicate simple style combines the cosiness of a home with a modern international appearance. 1. So tell us Pascale, how did it all start? It started when I was in my early twenties and I started to import furniture from Italy to Switzerland for my friends and co-workers. I was always drawn to aesthetics. The home interiors and beautiful gardens were always my passion so one day I decided to dedicate not only my passion to my own home, but to create beautiful homes for others. 2. And who do you owe your success to? I owe my success to many different individuals who supported me throughout these years of starting-up and and who helped me in giving me the opportunity to become an independent business woman and mother. The names of the list of people is very long! 3. Which article is a” must-have” in your shop? They all are – and they keep changing – but one of them are the Baobab Candles which always make a nice gift to someone or even to yourself. 4. Which is your favorite place in Gstaad? I love the Wasserngrat mountain, the Arnensee and of course the Spa at the Palace Hotel. 5. And your favourite restaurant? Hard to narrow it down to just one, some of my favorites are: Megu at the Alpina, Restaurant 16 in Saanen, Le Comptoir d’Enhaut in Rougemont, Posthotel Rösseli are just a few. 6. Which website/ magazine inspires you? 7. Which shopping town you enjoy the most? 8. And your favorite holiday destination? I love Provence – I love the smell, the colors, the homes, the food and of course the wine. 10. Which food would we find always in your fridge? 11. And finally, which item identifies you? I would say my watch, as it was a present from my parents.